This article discusses technical solutions and application examples for CAN-based systems, which combine electrical CAN segments with fiber optic communication links. Among those systems three basic principles of linking electrical CAN segments with fiber optic links are considered. CAN with the corresponding physical layer standards for electrical signaling is a powerful, robust and cost effective communication network for industrial control applications. So why add optical fiber links to CAN systems? There are a number of ways how the overall behavior of CAN-based systems may be improved by use of optical fiber links as additional system components. Some of the benefits that can be achieved are improved EMC behavior, increased flexibility regarding installation topologies, enhanced communication system speed and throughput with reduced latency. Another reason to use optical fiber links in CAN based systems may simply be to deal with existing infrastructure. Meanwhile many building automation or transport systems include bundles of installed glass fiber, whilst signal lines for electrical CAN data transmission are not in place. The most straightforward solution to add optical transmission is already implemented in most CAN devices in automation systems, however it is rarely applied in the form of a fiber link. It is realized by the optocouplers between CAN controller and CAN transceiver. The same principle - putting an optical link into the transmit and receive line between CAN controller and CAN transceiver - can be applied for fiber systems. Functionally the optocoupler is cut into parts, which are connected by fiber segments. This solution is easy to implement and serves tasks like high voltage isolation quite well. An implementation example of this solution can be found in mining machinery from Voest Alpine Bergtechnik (www.voestalpine. com), a company within the Sandvik group. CAN nodes with fiber optic interface in the bolter miner series of machines are connected to a copper based CAN bus by fiber optic converters. While this is the preferable solution to connect individual nodes to a CAN network and fits the requirements of machinery well, with regard to system design there are limits of this approach. Specifically designed CAN nodes with a matching optical interface are required, off-the-shelf CAN components cannot be used. Furthermore the approach limits the network topology to a single bus structured electrical CAN segment, linking of spatially distributed electrical CAN segments is not possible. If optical fiber links are required to connect bus segments instead of individual CAN nodes, more complex solutions need to be implemented. One characteristic of CAN segments with standard electric signaling is that the direction of signal transmission is not easily available to an external observer. Due to the nature of CAN with bitwise arbitration, acknowledge flag and error frames, the direction of transmission changes even within one CAN frame. 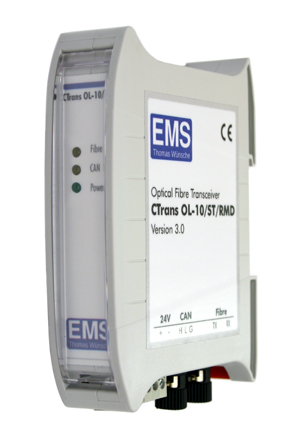 Active elements like fiber optic converters however need to know at which time to drive which of the interfaces. So while the direction of transmission is obvious as long as a single CAN controller is connected with its corresponding transceiver (dedicated Rx/Tx lines), the direction needs to be somehow regenerated to be able to connect bus segments by active elements. One of the solutions to achieve that is implemented by bitwise transparent CAN repeaters. Based on timing characteristics on the bus segments on both sides of the repeater, a transmission direction is regenerated and signals are propagated in the correct direction. This process is transparent with regard to content and timing of the communication. Characteristics of CAN like system wide data consistency are preserved. CAN repeaters can be implemented with optical isolation, placing optocouplers on the two unidirectional logical links within a repeater. 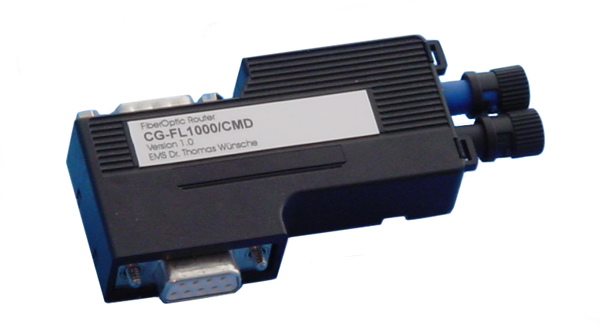 Like in the first solution the optocouplers can be replaced by optical fiber links. Compared to repeaters, fiber optic transceivers add additional flexibility in the installation topology. Since the fiber segments don’t count as stub lines regarding the high frequency behavior of the electrical subnets, fiber optic transceivers may be attached at any point within an electrical CAN segment to connect distributed electrical CAN segments. Electrical CAN segments may be kept short, which is of special benefit in environments with high EMC requirements. An example for the use of this type of fiber link is the Container Terminal Altenwerder in the port of Hamburg, one of the most modern container terminals throughout the world. The safety system on the cranes, which is implemented using the CAN based Safetybus p, is equipped with fiber optic transceivers for CAN. In contrast to the previous solutions, which preserve synchrony of data transmission on the bit level, the third solution, which is based on a store-and-forward principle, loses this property – with benefits and drawbacks. Fiber optic routers include a CAN controller on both of the local segments. Furthermore it adds delay, since in most solutions CAN frames are completely received on one end, before transmission on the other end may begin. Given the store-and-forward principle, arbitration for a message on the CAN segments at both ends of the fiber link occurs at different time. In the case of very high bus load this may lead to buffer fill-ups in the router, which don’t occur in bitwise transparent systems. CAN systems with routers become a lot more complex. On the other hand a number of benefits may be achieved by the use of optical fiber routers in CAN systems. Since the CAN segments have decoupled timing, different baud rates may be implemented on both ends. Furthermore, since the fiber link does not take part in CAN arbitration, acknowledge and error correction, propagation delays and latencies on the fiber link do not contribute to the propagation delay in the electrical CAN segments. Hence the bit rate in the electrical CAN segments is not limited by the use of long fiber links. CAN based systems with very high extensions may be implemented; fiber optic routers for CAN with an achievable length of a single optical link far beyond 40km are available. Nonetheless the electrical local CAN segments can operate at speeds up to 1 Mbit/s. An example for the application of this technology is the cable car in Åre, Sweden. The control system of the cable car, one of the central installations before the championships in 2007, has been re-engineered by Frey AG Stans, Switzerland and is using three optical fiber links to connect safety related components on the pylons. Fiber optic coupling of individual nodes or complete CAN segments can significantly improve the behavior of CAN based systems and can make CAN the optimum solution for application fields which could not be covered without this technology. Typical application fields for optical links in CAN installations are spatially distributed applications like transport systems and energy distribution. However also in more compact applications like heavy duty machinery optical fiber links for CAN based systems may provide adequate solutions. The selection of the appropriate method to implement an optical fiber link within a CAN based system has high influence on the benefits achieved. To reach the optimum system configuration the technology should be selected depending on the characteristics of the task as well as the solution.